Dive the “Graveyard of the Atlantic” with Giant Stride Dive Shop on our annual pilgrimage to NC! I’ve been coming back here every year since 2003 because the diving is freaking awesome. 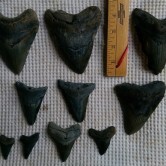 Come home with some Meg teeth, great memories of Great wrecks with Sand Tiger Sharks at good price with great viz! We will dive in Wilmington, NC on 6/14 first to do a Megalodon Shark Tooth (2 tank dive) then back to Morehead with Olympus Dive Center on 6/15 – 6/20 on some awesome shipwrecks in 80 to 130 fsw, viz is 40 to 100 ft. Water temp. is in the 80’s! You can view the wrecks we will dive at www.olympusdiving.com. I’ll drive down on the evening of 6/12 at around 6pm to avoid traffic so I can take my own tanks and gear arriving sometime in the afternoon in Wilmington. (you can rent tanks and lead from Olympus if you Fly & don’t want to drive.) Wilmington is a 16 hour drive Morehead is 2 hours north of that. You must have an Advanced Open Water Cert. (that means bring it with you), SMB, safety sausage or liftbag, whistle and we recommend a redundant air source. A Dive Computer and Hyperbaric Insurance is also mandatory! (DAN Insurance or equivalent) Call 4o1-7three2-8808 for more info or just come in and sign up, and leave a deposit to insure your spot. Deposits constitute a commitment and are non refundable. Call the Store to let me know you’re interested. The cost for 2 Megalodon Tooth dives and 6 days of 2 tank wreck diving and lodging in a Motel in Wilmington and a Beach front house in Atlantic City Beach is $1675.00 CC, cash or check. A $500.00 Deposit is required to hold your spot No exceptions. A $50.00 discount will be deducted for those paying in full in cash or check before March 10th. Full payment is due by May 14th 2019.